Heraclix and Pomp, Aguirre's first full-length novel, explores the ideas of identity and immortality through the eyes of a man-like golem and a time-bending fairy who can barely grasp the idea of now, much less the dangers of what's to come. Before being sewn-together, Heraclix was dead--merely a pile of mismatched pieces, collected from the corpses of many troubled men. And Pomp was immortal--at least, so she thought. That was before her impossible near-murder at the hands of the necromancer, Heraclix's creator. But when playing God, even the smallest error is a gargantuan weakness. When the necromancer makes his, Heraclix and Pomp begin their epic flight. 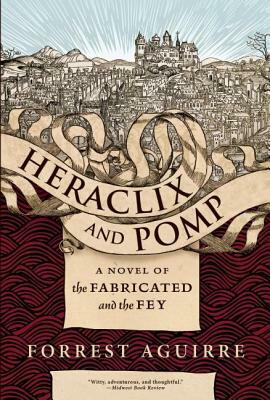 Heraclix and Pomp is a richly textured and decadent read, filled with Baroque ideology and Byzantine political intrigue. Fans of fantasy and historical fiction alike will revel in Aguirre's layered prose and vivid characterizations. Heraclix and Pomp brings the surreal and the macabre to one of history's most violent eras, and it does so in a voice sure to resonate among this season's best new releases. Forrest Aguirre's short fiction has appeared in more than 60 venues, including such wide-ranging magazines and anthologies as Asimov's, Gargoyle, Exquisite Corpse, 3rd Bed, American Letters and Commentary, Notre Dame Review, Polyphony, DIAGRAM, Clockwork Phoenix, and Paper Cities. His work has been honorably mentioned in various year's best anthologies, and one of his stories was a StorySouth Million Writer's Award notable. His short fiction has been collected in Fugue XXIX. His editorial work has been recognized with a World Fantasy Award. He has edited or coedited Leviathan 3, Leviathan 4, Nine Muses, and Text: UR The New Book of Masks. Aguirre lives in Madison, WI, with his wife and children.